Members of the Hellenic and Roman Socities may use the Library and borrow up to four volumes per Society (either in person or by post). 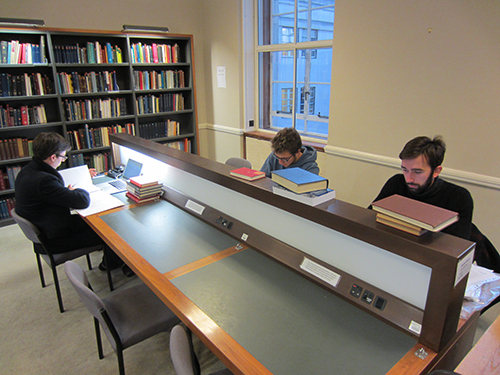 The Societies are open to all those interested in any aspect of Hellenic or Roman Studies. Membership also includes receipt of the Societies' journals and invitations to events including lectures, conferences, and visits to exhibitions and sites. Join the Hellenic Society here online or download a membership form. 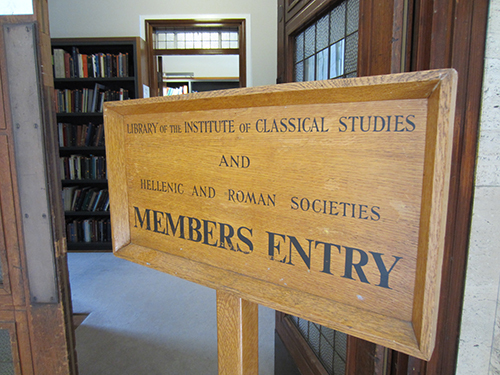 Join the Roman Society here online or download a membership form. Members of the ICS may use the Library but not borrow books. Membership is free of charge and is open to teachers, graduate students, and others with the approval of the Director. More information can be found here. Subject to the discretion of the Librarian, anyone with appropriate accreditation / photo I.D. may apply for reference access for a maximum of two days, particularly to consult material not available elsewhere, by completing a Visitor's form upon entry to the Library. However, the Librarian reserves the right to refuse admission. If the Library is overcrowded at any time non-members may be asked to return when there is less pressure on space.